Located about 22 km from the place of Badami is the UNESCO World Heritage Site of Pattadakal which possesses monument depicting the ancient magnificent and lavish Indian architecture. The sculptures and carvings of these monuments depict a clear picture of the discretion and vision of our old Indian kings. The monument is a group of ten shrines, among them nine temples are Hindu temples. Among these ten temples, four are built in a Dravidian style, four temples are constructed in Nagara style and Papanatha temple is a mixture of both the styles. These Pattadakal monuments were constructed by the Queen as a celebration of victory of the king Vikramaditya II over the Kanchi Pallavas and are situated at the centre of pretty good lawn. The walls of these temples are carved with various scenes from the epics of Mahabharata, Ramayana and also friezes of men moving towards the battle fields, voluptuous goddesses and demons. There is also presence of gigantic Nandi Bull built from a black stone at one corner. If one happens to visit during the end of January month, there is a chance to enjoy the classical dance festival. Although the construction remains incomplete in some of the temples, they still possess an enchanting and attractive posture. The ancient sculptures embellished the subjects of women, demons and Gods. It is really wonderful to see the whole complex of monuments standing tall against the desolate of time. A deep observation of these structures will depict the advancement in our country on the basis of breathtaking construction even as early as 7th century. The wrecked but still eloquent monuments at Pattadakal attract both the domestic and also foreign tourists. The cluster of monuments at Pattadakal was constructed during the 7th to 8th century and is located in the south most part of Karnataka state. Apart from the popularity for Chalukyan architectural excellence, Pattadakal also acts as a holy region for Pattadakal, a royal coronation. These temples depict a pleasant mixture of architectural style of south and north India i.e. Dravida Vimana style and the Rekha Nagara Prasada style of temple construction. There will be delicate and graceful details in the sculptural art showcased by the early Chalukyas. Chalukyan emperors were great supporters of art apart from their well known empire construction. Their superior support to the craftsmen and artists encouraged them to do many experiments and bring out new styles in architecture thereby delivering a novel dimension. The transition from the rock-cut medium to novel structural temples happened during this era. The roof panels of the dikpalas, navagrahas and the dancing Nataraja and the wall alcoves possessing Ardhanrisvara, Lingodbhava, Varahavishnu, Tripurari and also Trivikrama depicts enough illustration of the sculptor’s potential and also the cult worship which was a trend. The Pattadakal possesses a cluster of ten main temples, each of them depicting fabulous architectural design and represent the high end of their diverse art. Among these temples, none of them are Hindu shrines together with a Jain sanctuary encircled by various small plinths and shrines. 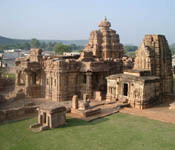 This cluster of monuments present in Pattadakal was credited as a World Heritage Site during the year 1987. Among these ten temples, four of them were constructed in Dravidian style; four of them were built in north Indian Nagara style, whereas the Papanatha swamy temple is a blend of both the styles. Sangameswara Temple is oldest among all the temples which is simple but a huge temple constructed by Chalukya Vijayaditya Satyasraya (specifically 697-733 AD). The style is closer to the Pallava form with the absence of sukanasika whereas the other two bearing this style are the earliest Chalukyan style and also the derivatives containing this architectural form is the Kailasa situated at Ellora. The prominent Sangameswara Vimana is made of three storeys. The bottom storey is encircled by an inner and outer walls, the second storey stands as an upwards projection of inner wall, in which the outer wall surrounds the closed circumambulatory around the sanctum. In spite of incompletion, this temple remains attractive. The Mallikarjuna Temple is same as that of the Virupaksha temple, as this was also constructed by another Vikramaditya II queen, immediately after Virupaksha temple and is also adjacent to the former one, in order to celebrate the victory of Chalukyas against the Pallavas. Mallikarjuna temple is a smaller temple constructed as a four storey Vimana comprising a Shikara and circular griva. Another resemblance in the architecture is that there is a large°similarity to the south Indian elements in the Vimana as freezed in contemporary Pallava shrines. Both the Virupaksha and the Sangameswara temples are highly resembled each other right from square plan from base to sikhara. The other significant shrines at Pattadakal are Jambulinga, Kadasiddhesvara and also Galaganatha temples constructed during 7th century A.D. among these, the Galaganatha temple was constructed a century later but in a rekha nagara prasada style. It comprises the Lord Shiva sculpture destructing the Andhakasura demon. The Kadasiddeshvara temple possess a Shiva sculpture in the posture of possessing a Trishul of Trident in his hands together with its twin temple , Jambulinga temple consists of a fantastic posture of dancing Shiva together with his Nandi (bull) and Parvathi along his side. There temples were constructed in the nagara style and inspired from the Hucchimalli Guddi located at Aihole. The temple was constructed with north style tower of a horse-shoe arched projection located on its façade. The Kasivisvesvara Temple is the last temple to get constructed with the early Chalukyan style. Mallikarjuna temple was built by the queen Trilokyamahadevi to commemorate the victory of the King Vikramaditya II against Pallavas. 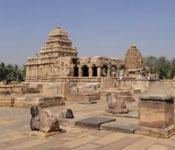 Although the last construction at Pattadakal was done during the era of Rashtrakuta ruler Krishna II (9th century A.D) in the form of Jain temple, popular as Jaina Narayana possessing two functional lower storeys. The Jain Temple situated on Pattadakal-Badami road, is constructed in the style of Dravidian by Rashtrakutas of Manyakheta. The temple possesses few of the marvelous sculptures which were of 9th century and was constructed either of King Amoghavarsha I or Krishna II, his son. There are also other significant monuments with a monolithic stone pillar with carved inscriptions are Chandrashekara temple, Naganatha temple and also inscriptions in Mahakuteshwara temple. 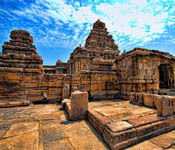 The region of Pattadakal possesses moderate climatic conditions all round the year. The ideal time to visit is from October to February. Winter season (November – February ) delivers a cool and pleasant environment where the minimum temperature will be around 10°C and maximum temperature around 32°C. this is the best time for sightseeing and also to explore the area. Summer season (March – mid May) comprise a mild hot weather except for the month of April as the temperature ranges between the minimum of 22°C to maximum of 40°C. Nights are proportional cooler than day time. Monsoon season (Mid May – September) brings substantial rainfall resulting in temperature drop considerably. There may be extreme cold during night time. This is also ideal time to visit as the area experiences brief breaks in the rain. The nearby railway station is situated at Badami situated at a distance of approximately 20 km from Pattadakal. There are plenty of autos that service between Badami railway station to the town. This is the fastest and cheapest method to reach Pattadakal. The autos may charge about 300 INR for the journey. There are train route from the Mysore and also other parts of Karnataka to Badami. Bangalore comes under the nearest airport with the distance of 449 km. one can reach Pattadakal from the Bangalore airport through frequently available taxi and bus services which are from Bangalore and Mysore. There are government bus services from Bangalore to Pattadakal. The service is available frequently and is also cheap. They charge about INR 300 for the journey. However the buses are generally cramped and it might not be an ideal preference for long distance travel.